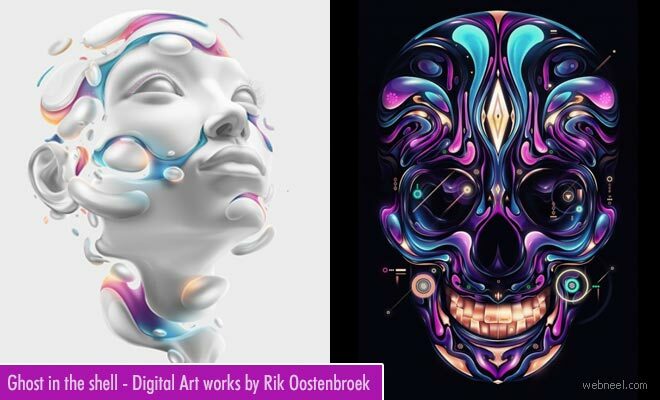 Rik Oostenbroek is an art director and illustrator who loves happy colours and flowing shapes. The ghost in the shell movie illustrations are used as official content for social media campaigns and activation. Rik's illustrations got full 'Unlimited power' on the course which permitted to truly redefine known limits. In the words of Rik, "...the honor I felt working with and for them in such an organic way was immense.Therefore I really wanted to try out new things, push my modeling, texturing and lighting skills for this project. Just for the sake of learning and not repeating myself, that's also the reason why I choose to go for a dark portrait instead of a bright one".